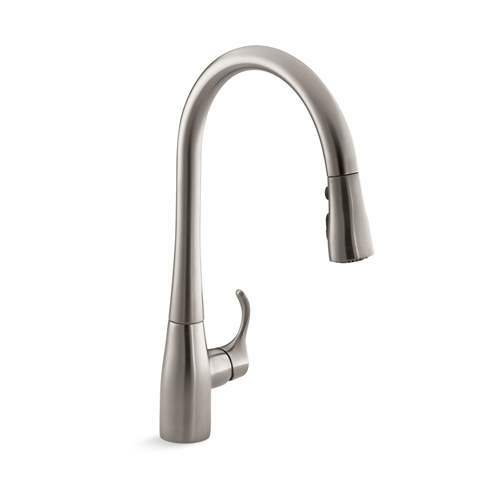 I have a Kohler Simplice kitchen faucet. Over the years, it has occasionally had issues with low water pressure. I’ve had to take it apart several times, and have narrowed it down to a couple of common problems. In this article, I’ll explain how to quickly diagnose and fix it, so you don’t have to spend hours on it like I did. First we need to figure out where the problem lies. Are both the hot and cold water flowing slowly? 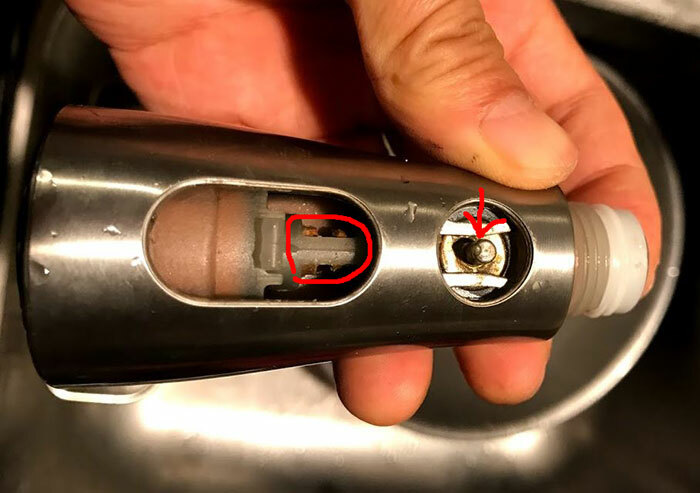 If so, the problem is likely in the spray head assembly. See Spray Head section below. Is only one side flowing slowly? If only hot or cold is flowing slowly, and the other side is flowing fine, then the problem is likely that an inlet screen is clogged. See Clogged Inlet Screen section below. Turn on the water full blast. If it flows out of the hose strongly, then your spray head is definitely the culprit. With dry fingers, pull the black plastic buttons off the spray head. 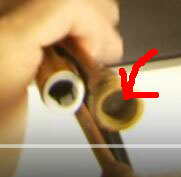 The entire black plastic face containing the aerator should be removable if you grab the flat sides of the inner black core around the aerator (see red arrows in photo above) with a wrench and unscrew it. Unfortunately, mine was glued on by serious calcium deposits (in the photo above, I’ve already cleaned off the calcium but it was still stuck). If you can unscrew the black plastic face assembly, you can disassemble and clean the aerator more thoroughly. Since mine was stuck, I simply soaked both ends of the spray head in hot vinegar, and then used a brush to rub off the remaining calcium deposits. 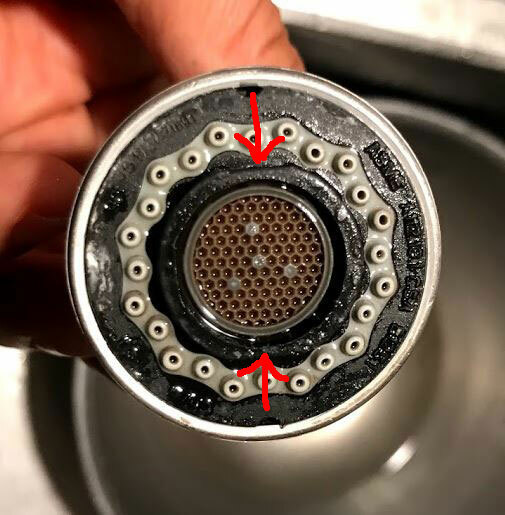 If the gray jet holes are not clean, you can also insert a round toothpick into each hole, and rotate it to clean it out. Reinstall the spray head and test. The water should be flowing strongly now. If so, you are done. 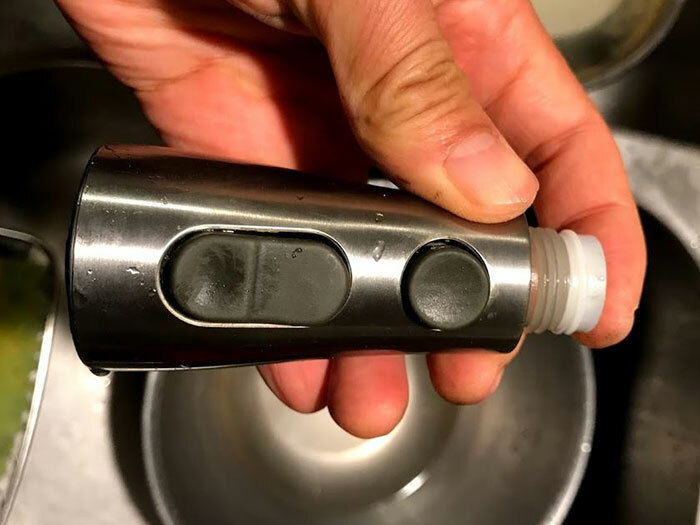 If only the hot or cold side (usually only the hot side) flows slowly, while the other side flows strongly, the inlet screen on the clogged side is probably clogged up with calcium deposits. 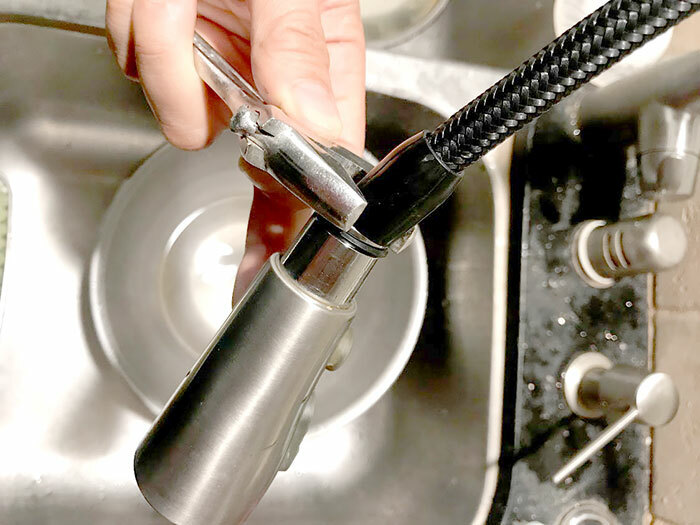 Go under the sink, and with two wrenches, unscrew and detach the inlet hose from the faucet on the side that’s clogged. sorry for the horrible photo. The red arrow in the photo above points to the inlet screen. It’s not removable, so you have to clean it in place. 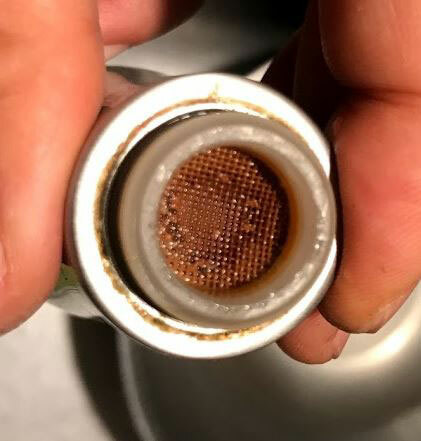 Mine was completely gunked up with calcium deposits that had broken loose from my old water heater. I used q-tips soaked in vinegar, followed by scraping with a small screwdriver to clean the screen. Reattach the inlet hose and test. If the water’s flowing strongly again, you’re done!